You won't see us doing wheelies, jumps or stunts but Casey Trees is going two-wheelin' as of this summer. Casey Trees, well-known for launching innovative initiatives advancing urban forestry such the Annual Tree Report Card, Urban Tree Canopy Goal (40 percent by 2035), and the Casey Trees Map, is rolling out another one this summer - bicycle-mounted tree stewards. Led by a Bicycle Crew Chief, Casey Trees High School Urban Forestry Summer Interns will be watering trees by bike - primarily in downtown DC. 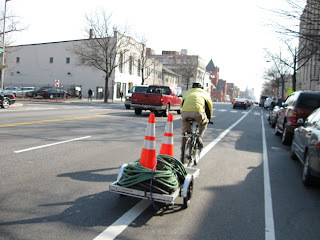 All bike stewards will be outfitted with helmets and be properly trained in bicycle safety and laws. We strongly believe the bicycle crew pilot project has enormous potential. First and foremost, bike tree stewards will allow Casey Trees to water trees with greater efficiency - no more fighting traffic, trying to locate street parking, etc. Second, our bicycle-mounted signage will remind pedestrians and drivers to water their trees especially during the hot summer months. Third, Casey Trees will become even more environmentally responsible. The bonus - Casey Trees will have some seriously fit staff and interns. The industrial bike-trailer (preliminary design mockup above) to haul safety cones, hoses and the such is already ordered - now we just need a fleet of bikes for the interns to ride. If you have an extra bike laying around, consider donating it to Casey Trees. We will put it to good use. Send a picture or description of the bike(s) to mfried@caseytrees.org and we will be in touch. We will even pick it up. With your help, you will soon see a fancier version of the below hitting the streets of DC. Casey Trees’ mission is to restore, enhance, and protect the tree canopy of the Nation's Capital. Designed by Insight Blog Design. Powered by Blogger.